CUMA PROJECT is an independent street art project whose aim is to support people and communities of Latin America, whose stories of resistance don't find space in the main media. It's important to listen to the stories of these people, which deserve to be known, understood and remembered, and an important part of the sale of our screen prints and original artworks is aimed at their support. And in order to celebrate them, we devote our resources to the production of murals and documentaries that can explain the political, social and economic context that we witness. We believe that for an authentic change of our society a sincere love for humanity, truth and justice is necessary. Street art, in its best expressions, expresses (conveys) this quality. Thus we think it's consistent that this artistic expression can develop a virtuous circle that can produce the resources needed to relate and support people whose life can be an inspiration so that we can undertake a path of solidarity, reflection and critique. However, in order to make this happen, this virtuous circle must have the fundamental and essential characteristic of economic sustainability. Only this way we can begin a journey that can keep its independence that can be immune to external pressures that may want to manipulate its nature. In the months of April and May 2016, Cuma Project visited the indigenous communities of Llano Grande, La Ceibita, Las Delicias, Las Mesitas and Rio Blanco of the Lenca ethnic group in the Department of Intibucà and San Francisco Lempira, Honduras, where the street artists Stinkfish, Mazatl and Kill Joy painted wonderful murals in schools and communal houses. Our partner was the indigenous organisation COPINH (Council of Popular and Indigenous Organisations of Honduras), whose leader Berta Caceres was killed in March 2016 due to her activism against the violent imposition of hydroelectric projects, especially the construction of the Agua Zarca dam on the Gualcarque River. The communities visited by Cuma Project are affected by the projects of dams along their rivers, which have already had as a consequence the assassination of several members of the communities who were trying to stop the construction. Multinationals are forcing their presence thanks to the direct intervention of the military and its special units, the police, paramilitary groups, the private security companies and hit men. The Lenca people are mainly very small farmers who work their land and fish for their own subsistence, thus the construction of the hydroelectric projects seriously affect their livelihood as the environment they live in with its unique variety of animals and plants. For the first edition of Cuma Project we decided to focus on Honduras because nowadays this country represents one the most dramatic examples in Latin America of the extreme consequences that can be reached by the alliance between the private and public sectors and the following privatisation of natural resources. After the brutal 2009 coup and the following acceleration in the process of concessions of rivers, the situation is getting even more dramatic under the current president Juan Orlando Hernandez whose decrees are giving the opportunity to Honduran and international private sectors to reach a level of power never achieved before with a parallel dramatic increase of repression of the local communities which do not accept such violent imposition. Inside of this bleak context, the violence has reached its peak in the Lenca communities. As our main objective is to support and spread information about the struggle of local popular organisations and indigenous communities, we thought that starting our path in this Central American country would be consistent with our aim. Painting murals in these remote indigenous communities was a great challenge, from a logistic and organizational point of view. However, most of all it was a great opportunity for all the team of Cuma Project to get a better understanding of the local social and political dynamics. We realised the repression of the Honduran government and its security forces on the people of these communities, especially on COPINH members. We listened to stories of hit men paid by the private companies in order to kill other people, even members of their own communities, simply because they oppose the construction of a dam. We witnessed what unity means as people try to resist, but sometimes we also witnessed division inside the communities themselves. The dam constructing companies promise roads, electricity to win people on their side. At the same time they allegedly pay people, frequently among the most violent elements of the communities or from outside, to threaten the other villagers who might be against the construction of the dam and especially the members of COPINH. Many people have to live in terror because men in their own community or in the proximity have tried or promised to kill them for their political affiliation or simply for disagreeing with the private companies. Cuma Project organised this initiative so that the artists could take their time, with no rush. On the contrary to the classic street art projects in the city, influenced by its fast dynamics, the rural environment was the ideal space in which the artists could talk extensively with the people learning from their experiences. Listening to the stories of the families we met during our journey was dramatic. However, it was also extremely revealing, because we always hear and read about things such as neoliberal policies, privatisation of natural resources, regimes, repression of popular organisations, but we don't really grasp their meaning until we witness their implications on the every day life of the real people involved. Cuma Project is not limited to street art in rural indigenous communities. It is also about expressing the socio-political, cultural, economic and environmental context in which the artistic project took place. 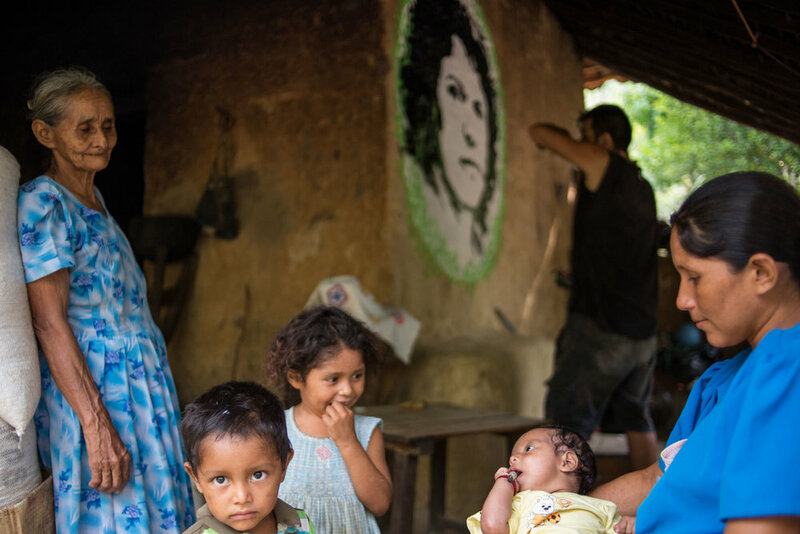 In so doing, street art can convey a broader story, a story of struggle and repression, a story that can be shared to raise awareness and support for the people affected by the hydroelectric projects. We chose to document our first initiative with a photographic reportage. We are delighted the talented Colombian photographer Victor Galeano accepted to join our team. The majority of the photographs in this reportage were taken in the community of Rio Blanco. Rio Blanco is one of the most conflictive areas in the Lenca territory, lying along the Gualcarque River, where the Honduran company DESA Desarrollo Energetico S.A. began the construction of the Agua Zarca dam. DESA is among those accused of the death of Berta Caceres. DESA began the construction with the Chinese multinational SINOHYDRO and the German SIEMENS, which withdrew from the contract due to the human rights abuses in the area after Berta’s murder. Among the financial institutions involved there were the FMO (the Dutch Development Bank), the FINNFUND (the Finnish Development Bank), the World Bank, the Central American Bank for the Economic Integration and USAID, the American Agency for International Development; they all withdrew after Berta’s death. DESA moved the construction site to the other side of the river, so that for the people of Rio Blanco it will become much more complicated to supervise and oppose the construction. At the moment the construction has stopped. However, the Honduran government renewed its support to DESA. The Agua Zarca project can restart any time. The struggle continues. Berta, as a symbol of resistance and perseverance, is a point of reference followed by the Lenca in their fight for their future. For more details on the conflict of Rio Blanco please read the following report written by the Centro de Estudio para la Democracia (CESPAD) with the support of COPINH (unfortunately this document only exists in spanish).